Open wide! February 9, 2019 is International Dentist Day – a day to celebrate one of the oldest and most important jobs in the world. While you might not be the biggest fan of sitting in the dentist’s chair, you can’t deny that keeping our teeth clean and shiny is a huge part of our overall health. What better way to honour IDD than to dive into an underwater exploration of the different kinds of tooth adaptations found in the ocean? When you think of fish teeth, it’s likely that an image of a shark’s serrated chompers pops into your head. Oceanic sharks (also called pelagic sharks) that feed on large fish and mammals such as sea lions and dolphins have that famous combination of pointed lower teeth and triangular upper teeth – perfect for cutting their larger prey into easy-to-swallow pieces. But those aren’t the only kind of shark teeth – not by a long shot. Other pelagic sharks like hammerhead sharks have needle-like teeth, better-suited for feeding on small or medium-sized fish. 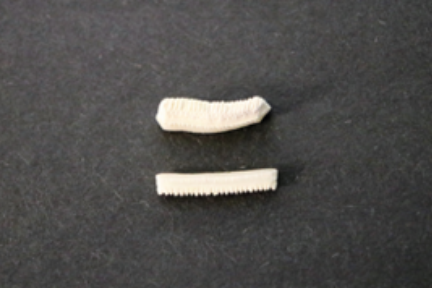 These teeth are best for gripping the slippery, narrow bodies of their fishy prey. What about filter-feeding sharks like whale and basking sharks? These gentle giants pass water through their huge mouths and out through their gills – filtering out nutrients in the form of plankton and fish eggs. 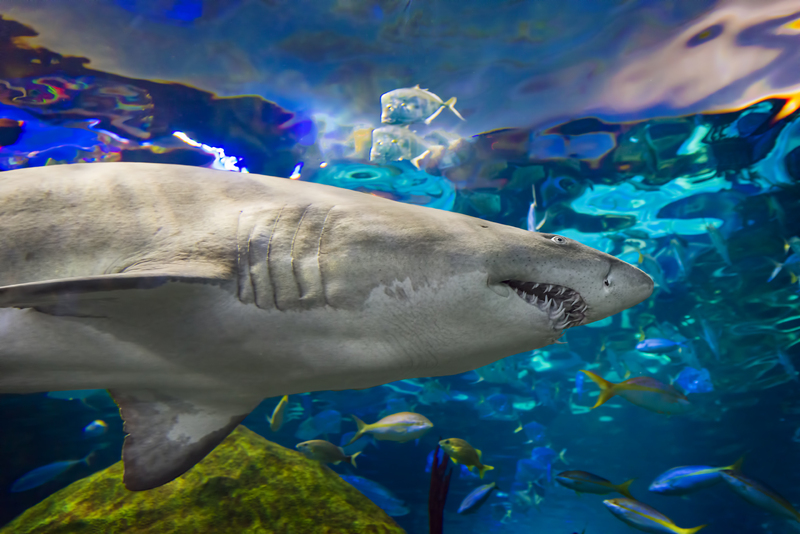 But while these sharks don’t need teeth for feeding, they have what are called vestigial teeth – tiny, leftover teeth from a time in their evolution when they would have used them. new teeth will constantly move up and replace those lost throughout the shark’s life – sorry dentists, sharks are an animal that just don’t need your help! Stingrays are related to sharks (think of them as cousins), but their lifestyle is quite different. Stingrays are bottom-dwelling or benthic animals. They seek out their prey (shellfish, crustaceans, fish and squid) on the ocean floor and can hide under the sand from their own predators. Their body shape reflects this lifestyle – with their mouth located underneath their bodies for easy hunting in the sand, and their eyes resting on top of their bodies, to keep an eye out for predators above – and so do their teeth. Stingray teeth are modified placoid scales – the same scales that cover their (and sharks’) bodies. Another name for these scales is dermal denticles, which literally means “skin teeth,” and that’s a very apt description. The scales have a central pulp cavity supplied by blood vessels, surrounded by a layer of dentin, and covered with an enamel-like substance – very similar to our own teeth. The placoid scales in the stingray’s mouth are large and flat, allowing them to crush the hard bodies of their preferred prey. They, like shark teeth, are also regularly shed and replaced. Toothed whales and dolphins such as orcas and belugas have conical teeth for grasping and tearing their prey, but let’s take a minute to talk about baleen. Baleen whales like the blue and fin whale are filter feeders. They open their mouths and take in water, then push it back out through their baleen – long, rigid, hair-like structures that hang in plates from the upper jaw – trapping small prey such as krill, which the whale then eats. 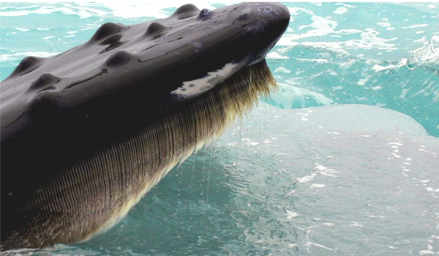 Baleen is made up of keratin – the same protein found in our own fingernails and hair. 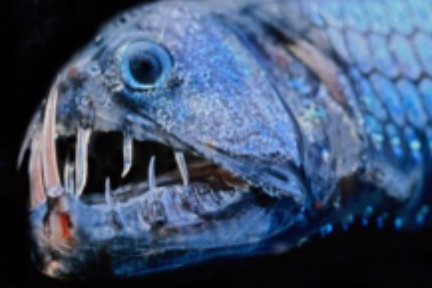 How could we talk about underwater teeth without mentioning the viperfish? This deep-sea fish is known for its long, needle-like teeth and hinged lower jaw, similar to a snake. Their teeth are so long that the viperfish would not be able to close its mouth if it were not able to fold and curve its teeth behind its head! Viperfish use these impressive teeth to impale their prey, helped by bursts of speed. Their bite is so ferocious that the first vertebra behind their head is designed as a sort of shock absorber. Speaking of weird mouths… Moray eels have two of them. Yup, that’s right. They have a second set of jaws called pharyngeal jaws…in their throats. While other fish species have pharyngeal jaws, the moray eel’s is especially unique – it is fully extendable, and can come up from the back of the throat to grasp prey and retract it back into the eel’s gullet, where it is then swallowed. Scientists believe that this may be an adaptation to the moray eel’s habitat – they cannot create the negative pressure needed by fish to swallow in the constricted space of their burrows. So there you have it – the ocean is just full of strange and wonderful teeth. A dentist’s dream, really! Make sure to give your dentist – and your teeth – some love today! After all, we only get one set. 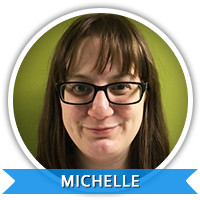 Michelle is an Educator at Ripley’s Aquarium of Canada. In a previous life she was a journalist, then returned to school to pursue her childhood dream of working with animals. She received her veterinary technician diploma from Algonquin College in 2017 and worked as an RVT in small animal clinics in the GTA. She’s thrilled to finally be pursuing her passion for marine life and conservation at Ripley’s Aquarium of Canada.